For three hours, there was torrential rain — and 105 mph winds. Because the storm was so slow-moving, at 2 mph, Cushing thought he and his wife were in the clear. 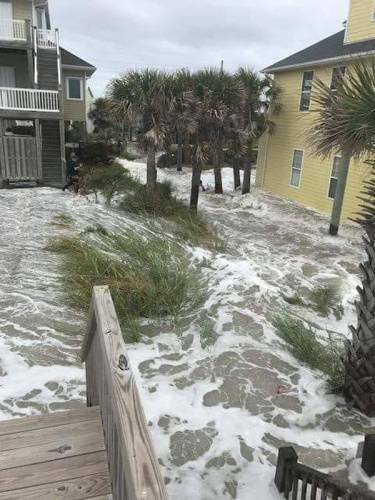 “We didn’t realize how terrible the backside of Florence was going to be,” he said. Saturday night, the backside bands of wind and rain came — sometimes up to 3 inches an hour. Hearing constant wind against the house and seeing his front yard and driveway flooded was eerie. As leader of The Bridge, a 4-year-old new worshiping community that is now a chartered PC(USA) congregation, Cushing and his wife were planning on evacuating before the storm hit. But after hearing how difficult it would be to get back in, they decided to stay. 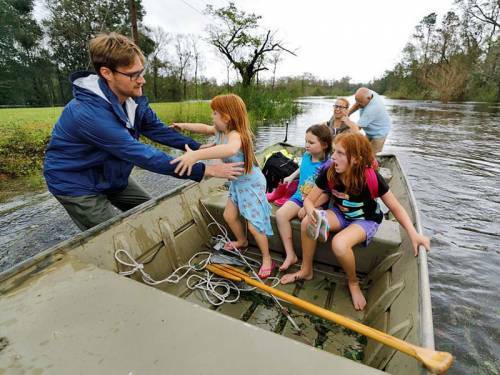 For days after Florence landed, folks in Leland were living on an island. Interstate 40 and two state highways into the Wilmington area were flooded and impassable. Until Wednesday, there was no way in and no way out. Those who had evacuated were cut off from their homes, and those who stayed were trapped. For a few days, the primary sound was quiet — except for helicopters in the sky. “It was the only way to get fuel and food in, which were becoming scarce,” Cushing said. To that end, Cushing was asked by Leland Mayor Brenda Bozeman to be a point person for coordinating food and other supplies to town residents, by working with Brunswick Family Assistance, which was designated as the primary distribution center for the county. 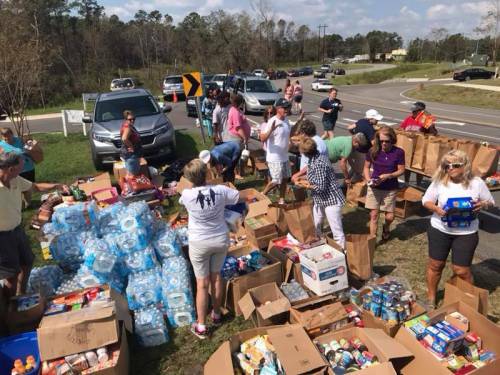 On Thursday, Bridge members who hadn’t evacuated joined Cushing and others in distributing food, water and other basic needs to hundreds of people lining the streets. Cushing came home after the five-hour food distribution, in 90-degree heat, feeling exhausted. And he still had a sermon to write. Because he’d been giving daily updates on his Facebook page, Cushing knew that hundreds of people and pastors were praying for him — and for those he’d seen who were suffering. Suddenly, he realized he always operated in a position of strength — of giving and serving. But now at Ground Zero of the storm, he realized how he needed the grace and generosity of the Presbyterian Church (U.S.A.) and body of Christ, who had reached out to him. “We need to name our pain and disorientation — while realizing the Spirit’s work is about reorientation,” he said. The makings of his sermon were underway. “Psalms are our voice to God — not God’s voice to us,” he said. Two days before Florence was supposed to hit, Cushing woke up with an idea. There were a lot of people in the area whose homes were on concrete slabs, like his. With about 12 inches between the ground and threshold of one’s doors, the 20 to 30 inches of projected rain meant there would be people out during the storm looking for shelter. “As I was praying, I felt strongly that we should open The Bridge,” said Cushing. Conveniently located on the second floor of a business center with a flat roof, he knew the space would be safe — and that it could sleep several families, if necessary. When Cushing floated the idea with his church session, he was amazed. Four elders had gone to sleep the night before or woken up with the same thought. For liability reasons, session members decided to open their rental space as a shelter for church members and any of their friends. Even though no one took them up on their offer, Cushing said people in neighborhoods around The Bridge told church members that the offer gave them a sense of hope — and that they were a place trying to shine light in a dark time. The Bridge is planning on providing a service of healing, hope and renewal for the Leland community next week. “Even though our house is fine, in our community the world has been turned upside down. It can be overwhelming for any of us,” said Cushing. “But I also feel energized at how the Lord is using us — binding us together as a community in ways that transcend all the typical arguments and polarization. The Bridge has just begun to have a conversation with Coastal Carolina Presbytery in conjunction with Presbyterian Disaster Assistance. They hope to host PC(USA) work groups in the foreseeable future — in the space that was offered as a storm shelter. Presbyterian Mission supported The Bridge with mission program grants through Racial Equity & Women’s Intercultural Ministries. The new worshiping community, which also received a Walton Award, became a chartered congregation in January 2018.